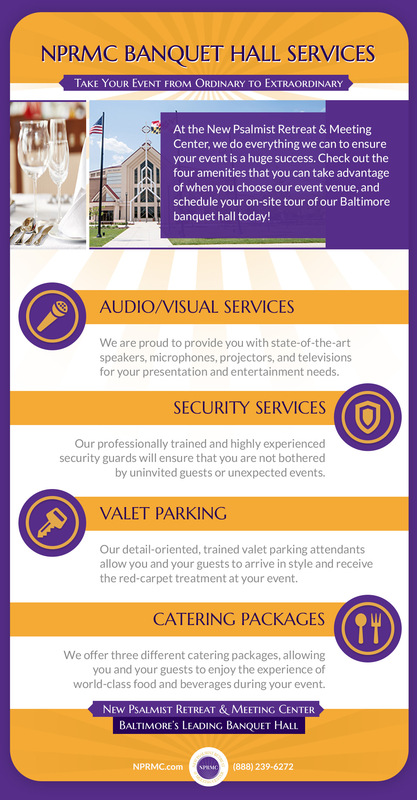 As the second largest banquet hall in Baltimore, you can count on the NPRMC team to help you host the event of a lifetime. Whether you are hosting 100 guests or more than 3,000 guests, we have your event services needs covered. In addition to our beautiful rooms, we also offer several amenities and services that are designed to streamline your event, ensuring that it goes off without a hitch. 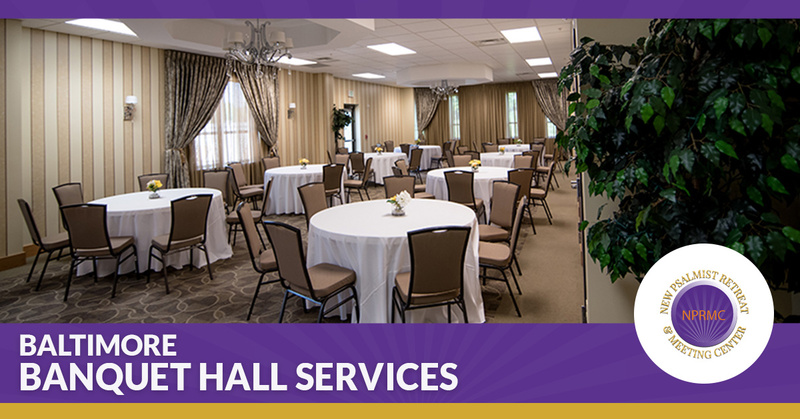 Contact our team to learn more about our banquet hall services and request your proposal today! From high-tech audio/visual services and security staff to valet and catering services, our team is prepared to assist you in any way possible with planning and hosting your event. State-of-the-art audio/visual services are key to hosting an engaging, fun, and interactive event. If you are giving a business presentation, the microphones and projectors should provide clear audio and crisp visual aids. Likewise, when you are dancing the night away at your wedding reception, the speakers and other sound system components should work together to provide the soundtrack for your big day. NPRMC is happy to provide you with high-tech audio visual services when you host your event at our banquet hall. At NPRMC, we take guest privacy and security very seriously. We understand that it can be challenging and distracting for you, as the host, to keep tabs on who is allowed to enter your event, especially if you have hundreds or thousands of guests. The last thing you will ever have to worry about is an unexpected or unwanted guest when you choose our event center. Our specially trained, experienced security personnel will ensure that there are no security concerns during your event. Just as the security of you and your guests is vitally important to us, so is the ability to find a parking spot and enter your event venue in style. The NPRMC facility boasts a full parking lot so you don’t have to worry about your car being parked on the street. You and your guests will receive the red carpet treatment when you arrive at your event. You don’t have to worry about finding parking or walking through inclement weather — our professional valet parking attendants are happy to assist you and your guests with all your parking needs. No event is complete without delectable catering services. Whether you are hosting a morning business meeting or a lavish evening wedding reception, you can count on the NPRMC team to delivery catering services that are as delicious as they are affordable. We proudly offer The Creative Culinary Experience with incredible breakfast, lunch, and dinner dishes prepared by Chef Jamel Boyd, as well as our Affordable Catering and Wedding Reception Packages. No matter which you choose, you will love our world-class catering services. Book Your Baltimore Banquet Hall! Are you ready to book your business conference, wedding reception, or another event? If so, then NPRMC is here to help! Our Baltimore banquet hall is perfect for every type of event, whether it is a small, intimate gathering or a large convention. You can rely on our audio/visual services, security, valet parking, and catering to provide you with an event that you and your guests will remember for a lifetime. Request you proposal today, or stop by for an on-site tour any Thursday between 11:00 a.m. and 4:00 p.m. We can’t wait to meet you!